As millennials increasingly dominate the healthcare workplace, they are setting new standards for excellence in the profession. Members of the Gen-Y age group want more from their nursing careers than their parents and grandparents had, including professional development opportunities, transparent quality measures, a positive culture and supportive leadership. Studies show millennials are changing the dynamics of the professional healthcare work environment. They are continually seeking to better themselves through education and career advancements when compared to their counterparts of other generations. They want workplaces that will change with them, and employers are adapting to the needs. Experts say millennials are breathing new life into healthcare. Studies also show millennials, born between 1981 and 1996, are more likely to seek an advanced education, including a Bachelor of Science in Nursing (BSN) degree, than their older coworkers. RN to BSN online programs appeal to digital natives because they provide collaboration, feedback and mentorship through technology. Millennial RNs are more likely than their older counterparts to consider new employment options. In fact, the survey found that about 17 percent of millennial RNs would seek new nursing positions, compared to 15 percent of Gen Xers and 10 percent of baby boomers. About 10 percent of millennial nurses said they would consider a travel nurse position, while only 6 percent of Gen Xers and 5 percent of baby boomers would consider the same. Millennial nurses also show a strong interest in advanced practice nursing, with about 28 percent saying they would pursue nurse practitioner degrees. About 19 percent of Gen Xers and 4 percent of baby boomers said they are interested in advanced practice nursing professions. More than 36 percent of surveyed millennial nurses said they are interested in leadership roles. About 25 percent of Gen X nurses and about 10 percent of baby boomers are similarly interested. However, the survey found a higher percentage of baby boomer nurses were already in leadership positions compared to their younger counterparts. Millennial nurses said they trusted their leadership and thought the leaders cared about them and their career development. In the survey, millennials more often “agreed” or “strongly agreed” when asked positive statements about their leaders than older nurses. Millennials also believe quality patient care and effective leadership go hand in hand. Like Gen Xers, millennial nurses view professional development as crucial to providing and improving patient care. Baby boomers also consider professional development opportunities to be important, but not as much as younger nurses. “It’s widely recognized that professional development is important to both attracting and retaining millennials in all professions, but it may be even more important in healthcare, where workforce demand is high and the need for expertise, quality care and team collaboration is significant,” AMN Healthcare researchers said. Almost half of the millennial nurses surveyed said they plan to pursue BSN degrees, about 40 percent said they plan to earn master’s degrees in nursing and about 11 percent said they would pursue a Ph.D. 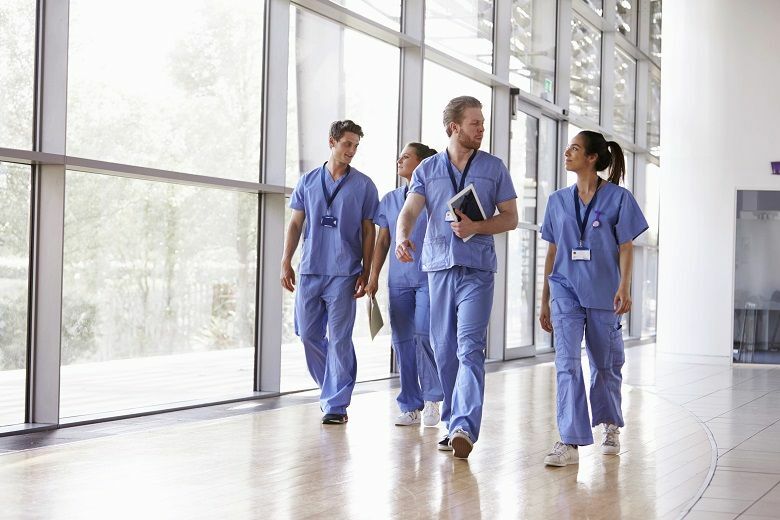 The survey showed millennial nurses are more likely to seek advanced practice degrees and professional certifications than their older counterparts. “It’s not surprising that younger nurses would be more interested in further educational attainment compared to older nurses, who are at the latter stages of their careers. Increasing education and training, however, is a priority for nursing in order to improve quality of care, so it’s a salutary trend if younger nurses remain dedicated to achieving higher degrees,” the survey said. Researchers also found millennials are optimistic about the future of technology in healthcare, including electronic medical records (EMR). They said EMR positively influences job satisfaction, the quality of patient care, time management and nursing productivity. Overall, researchers have found few, if any, disadvantages of having millennials in the healthcare workforce. Instead, their positive characteristics are advantageous to the profession — they are self-confident and believe they contribute value to the workforce; they are change agents and not afraid to question authority, the healthcare recruitment firm HealthStream said. As baby boomer nurses retire in droves, millennial RNs are stepping in to fill the need. But for many hospitals, earning an RN is not enough. The new standard for many healthcare institutions is a BSN degree. RN to BSN online programs make earning advanced degrees easier for nurses interested in continuing their careers and personal lives. At Duquesne University, RN to BSN online students have the opportunity to customize their educational experience while learning from practiced faculty mentors. Duquesne University’s 100 percent online RN-BSN program allows students to work from anywhere and at any time. Licensed RNs automatically earn 60 of the required 120 credit hours for the program. Those who already have a bachelor’s degree in another field and are a licensed RN are required to complete only 30 credit hours to earn a BSN. Students in the online RN-BSN program also have an opportunity to take master’s-level coursework for a head start on an MSN degree. Duquesne University has been educating nurses for more than 80 years as the founder of Pennsylvania’s first BSN program in 1937. The faculty and staff experts work to help every student succeed. For more information, contact Duquesne University now.